Today I'm going to talk about percentage squash. I don't like telling people when to hit which shots, but there are clearly times where a specific shot is a superior choice to another. Some players are more attacking or defensive in their nature; this could be due to their preference in style or their current technical skills. The challenge for the less skilled is that they are so focused on immediate results that they don't always play the most tactically sound shot. Defensive or attacking minds alike, the game has become faster and more attacking. This means there are times were the defensive players will need to learn how to take advantage of the openings they get, while the attacking players need to walk the fine line of forcing the action and being too patient waiting for the perfect opening. I recently read an article written by my old coach from university, Jack Fairs. The article is called 'Playing The Percentages - The Corner Stone Of Effective Play' and was published on September 16, 1985. Knowing how much the game has changed over the past 30 years I though it would be interesting to see how the tactics of squash have evolved as our equipment, training methods, scoring and our knowledge of the game have advanced. 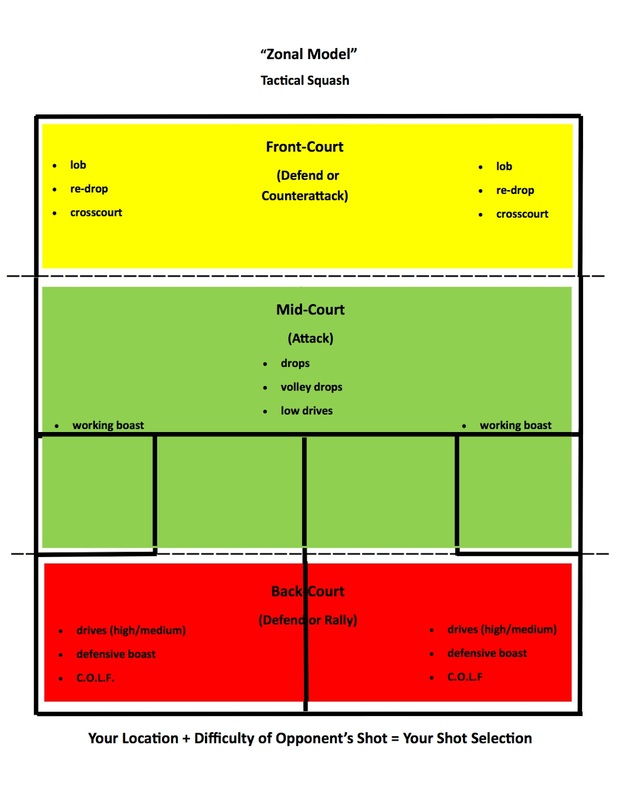 Jack's main concept in this article is that you should play percentage squash; basically hit high and deep from the back and low and attack when in front of your opponent. Jack further explains that when you receive a loose ball and you fail to attack you let your opponent off the hook and are not playing the high percentage, attacking shot. So although it may at first appear like a defensive strategy it really isn't, it's just about setting up a higher percentage attacking shot. We often see kids go for nicks when it's not really on. They may even hit 1 every so often, but playing winning squash is about setting up higher percentage openings and limiting your number of errors. Below is a decent decent model of this I found online. It's a basic stop light model about where on the court to attack or defend from. The basic strategy of defending from the back and attacking when in front sounds simple, but I still don't see it performed on a consistent basis. If you want to get better at implementing this tactic try and play condition games were you can only go short when you're in front of your opponent, or you can even try one where you must go short when you are in front of your opponent; this will allow you to commit to your short shots. I see a lot of players that only hit length and pass up these golden opportunities that they create. You can also try using some markers to section off the court so you must hit beyond them when you are in the back corners. This will ensure you are hitting your length deep and high enough while attempting to play smart, high percentage shots. I believe the biggest challenge is to stick to a basic strategy like this for the entirety of a match. Learning how to stick with your game plan for a prolonged period of time can be challenging physically and mentally. Sometimes we lose patience or our focus for just a second and then the next thing we know we are trying to hit a drop from a low percentage situation. We then get rattled about our foolish decision and give away another cheap point. Next thing we know our opponent has done nothing and won 2 or 3 rallies in a row. Top players very rarely have these prolonged blips in performance. Another way to practice playing the percentages is to use a 20+ year old racquet. I feel like many people today try and do too much because of modern day equipment, but this doesn't always mean the shot they are hitting is the correct, high percentage shot. If you play with an old, heavy frame you will realize quickly that you need to become more basic and need to set up a golden opportunity if you want to attack short effectively. 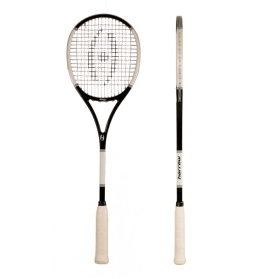 Pictured below is a picture of the old school, but new Harrow racquet. I have one of these and enjoy practicing with it. So when does the above strategy not apply? When I play, I'll go short when I notice my opponent hanging back to far on the T, if they are slow to the front or are getting tired. If you are going to go short from the back, just make sure there is a reason to why you are doing it and that you are properly balanced and set when doing so. Most people just get impatient and force the ball short trying to do too much. Watch the pros and notice how rarely they will attack from the back of the court and they have the best racquet skill in the world and they also play on a lower tin. A well disguised attacking boast in the women's game can be extremely effective and is one shot I really believe is essential to playing at a high level. If you want to attack from the back you must 1) know when the right time is and 2) know who this will work against and 3) be able to attack with a high level of skill. Another area I noticed as I developed as a squash player is that many people like to just hit length and if you do this you will make very few mistakes but you will be out there all day playing the match. So I would like to throw in a working boast at some point in the first game to find out what they do. Some players will always hit it back deep and to your backhand side so if they fall into this predictable trap I will do it over and over to shorten up the match and avoid the long, drawn out length rallies waiting patiently for an opening. When you're nearing the end of a game or match most of us begin to think about the finish line. The person leading often begins to force the play instead of sticking with their strategy all the way through. If you're down in this situation you have to realize that the person ahead is prone to losing focus and making a few cheap mistakes and then will likely get tense about giving up a lead and missing out on the previous game balls. So when you're down in a game and the end may seem near, just play very basic squash and you may be surprised what can happen. While if you're the person leading in the game your best strategy is to keep doing what you're doing and not let any game balls go to waste. Even though attacking only when in front is an extremely effective strategy and if you followed this you would be much tougher to beat, there are times when attacking from a lower-percentage court position can actually be a high-percentage play. It takes a lot of practice and experience to know when these situations are in a match and how to implement them. There's your strategy talk for the day. Keep it basic and simple and you'll be tougher to beat and you'll ensure that if you lose, it's your opponent beating you, not you beating yourself! For the more skilled, advanced and experienced players there is a time where being less predictable is the right play, but don't overdo and force the play or you'll be asking for trouble!